Why Be a Bartender in Cleveland, Ohio? Why Be a Bartender in Cleveland? Good pay. Great fun. Flexible hours. Jobs waiting for you NOW! Bartending is more than a job. It’s a respected profession offering serious hourly pay, mega tips, big-time benefits and more. That’s why hundreds have left traditional careers to “join the party” and celebrate a whole new way to make a living. Score big-time pay—and major perks! Earn more than most entry-level college grads – easily $100-$200 a day—without the expensive education and long hours. Plus, you’ll find that larger venues offer full benefits, and major hotels or airlines dish out extra perks like low-cost lodging and airfare. Choose a place that fits your personality. A good bartender can work anywhere in the country, or the world—from an elegant hotel, resort or country club to a friendly neighborhood bar, or high-energy nightspot. Work full- or part-time—around school, family or another job. Make bartending a profitable second career. Supplement seasonal or weather-dependent jobs, like construction. Or add fun and extra income to your retirement. When the economy’s down, people slash spending on big-ticket items. But bars and nightclubs actually thrive in tough times! 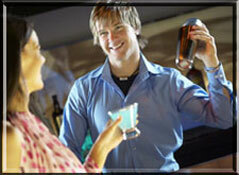 Plus, bartending is the perfect answer for office workers and others hit by corporate furloughs or cut-backs. Become a Professional Mixologist at Cleveland Bartending School. Call the BARTENDER HOTLINE today at 216-382-1450. Get the Facts into an Exciting New Career! Northeast Ohio’s bar and restaurant scene is alive! And our mixologists are in demand at hotspots like The View, East 4th Street, Tremont and West 6th, plus many others. The U.S. Department of Labor rates bartending opportunities as “excellent”—with a 13% increase in job openings expected through 2018. Cleveland Bartending School has been training Professional Mixologists since 1995—with more than 7,000 graduates! And we can help you too!